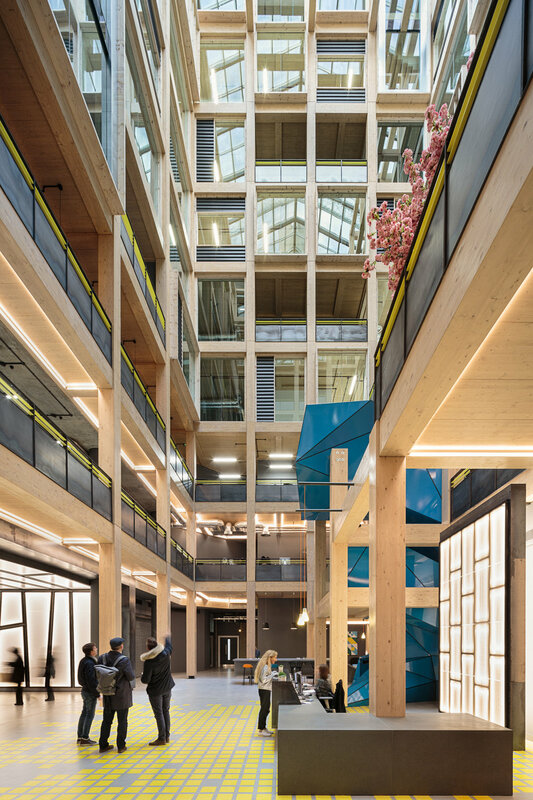 Originally built in 1990, the redevelopment of The Import Building at Republic has seen this office building revived with the insertion of a nine storey timber structure to add commercial floorspace and create new spatial connections between floors. Constructed from engineered timber in combination with modularised timber framed glazed facades, the new natural material palette contrasts with the rawness of the exposed existing concrete structure. Timber was selected for its high sustainability credentials but also for its malleable qualities. Republic has been featured in the following; Dezeen, Architects Journal, BLUEPRINT MAGAZINE, Property Week, SURFACE MATTER, OnOffice Magazine, NLA MAGAZINE, Refurb Project, NEw LONDON QUARTERLY, ESTATES GAZETTE & In Your Area.